I can hardly think of a thing to say, except that I have finally finished sewing the last stitch on this quilt, 'Stars on Point'. I love how it turned out and couldn't be more pleased. Mostly I'm pleased because it is finally done! And it's reversible! In the coming days I will be more able to reflect on what a monumental project this was for me, challenging me in every way, especially with new ideas, skills, and techniques. For now, since it is the first day of Autumn, I think I'll just wrap up in it and revel in the fact that it is finally finished, after 32 months in the making. I admit, I have been pretty remiss in posting here of late. I guess I just can't reconcile how to write about quilting while spending so much time at the sewing machine. Over the last several weeks, I've been immersed in quilting, diligently trying to finish a project that in January will hit the three year mark. My aqua and yellow quilt, which I've written about many times before, is close to completion. I have no pictures to post; at least not yet. I swore to myself I wouldn't post a picture until it is completely FINISHED! Not only has it been a joy to work on this quilt, but I have learned so much during the process. More about that when I post a picture. Spending so much time at the sewing machine, it wasn't just my hands that were busy. At times my thoughts kept pace with the breakneck speed of my needle. One of the thoughts that popped into my head, came from a seemingly far away place--my first job--one that I held while I was still in high school. Perhaps my love of quilting was rooted far before I sewed my first stitch. Nearly 50 years ago, I worked at Neisners, a five- and ten cent-variety store, located in a shopping center. I remember making $1.40 an hour, which was minimum wage at the time. It may not sound like much now, but it was enough to allow take the pressure off my parents when I wanted to buy bell bottom pants, mohair sweaters, Beatle records, and even to go roller skating on the weekends. As I was thinking about that job, I remember how much I enjoyed it. I worked after school and on weekends in the notions department. I didn't know very much about sewing in those days. But I liked all those little objects that were a part of it. Among the many tiny bins there were packages of needles, pins in heart-shaped plastic containers, pin cushions, safety pins, buttons, zippers, and the huge displays of thread. There were spools of thread in nearly every color, always neatly arranged. Rarely did we run out of a color. If I saw we were getting low, I ordered more. There were two or three rows of white and black spools, but there were also rows of colored thread arranged by varied shades from light to dark. In addition to waiting on customers, a big part of my responsibility was to keep all the shelves, bins, and counters tidy. I was responsible for ordering, stocking, and arranging displays of all those items. In those days, workers were told to "look busy if there were no customers to wait on. I didn't mind that at all because I always had something to arrange or rearrange. I enjoyed the work, so I didn't mind. I haven't thought about that job in years. Even now I struggle to remember more of the details. But, I remember enough to know that many of the practices I employed in that job have stayed with me, or perhaps come back to me. My sewing area is very small, so it is easy to make a real mess while working on a project. I have often laughed at myself for being so eager to clean up. When I finish for the evening or complete a project, I enjoy sweeping away stray threads, wiping away lint, sorting leftover fabric scraps, and generally putting everything in its place. I'm not a neatnik by any means; in fact, I'm quite the opposite in most other aspects of my life. But I really like a clean, efficient sewing area. I still like to arrange those little things. I'm relatively new at quilting--just 15 years now--so even though I thought all these tools of the trade were new to me, perhaps they really aren't. It wasn't until I really thought about it that I realize I am just revisiting a very old habit, one I undoubtedly was trained for from an earlier time in my life. I love that quilting is the kind of activity that lets me be alone with my thoughts. And there are times it is nice to revisit some of them. It has been some time since I mentioned the progress I and many others, are making on the Building Blocks Quilt Along, a project hosted by free-motion quilting instructor and free-motion quilting extraordinaire, Leah Day. 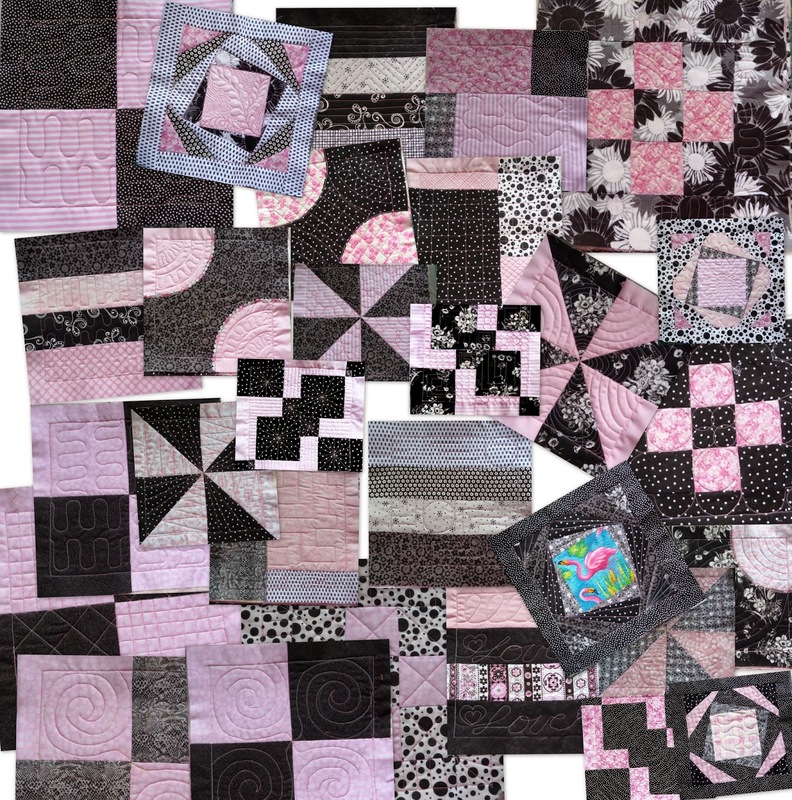 The blocks for this quilt which I'm calling "Black and white and pink all over," for obvious reasons, are stacking up nicely, with new blocks being completed regularly. The quilt should be completed by Thanksgiving. One thing has really confounded me about this project. Leah has instructed us to press our seams open. While I get the concept, actually doing it requires a change in habit and in thinking. It is a little more time-consuming to press the seams open, but it does help the quality of the free-motion quilting stitches when there aren't huge bumps to guide the needle over. Since I've been heavily engaged in quilting, I have come to realize that the pressing is nearly as important as the cutting and piecing. If pieces aren't pressed well, things just don't go together as well. But pressing seams open; I was having trouble with the discipline. I had learned to press seams to one side, and have always done it that way, as do most quilters. Pressing to one side makes nesting opposite seams fit together, which is essential in matching seams, angles, and points. I've found though, that when pinning two adjacent seams together, is is even easier to match. I hated maneuvering my iron over the sometimes multiple seams. And, working with a hot iron was pretty uncomfortable for my fingers. Being the problem-solver that I am, I thought I'd try a mini iron. Up until this point, I thought they were just silly gizmos that only people with lots of money bought. I am a frugal quilter, so I rarely entertain the idea of buying gadgets. Then one day, I realized this might be the solution to my dreaded open seams problem. I wrote mini iron on the shopping list. My husband John, who hates being cooped up in the house, likes to run errands. I am a home body with a capital H, so I prefer to stay home. It works well for us. John is always good about sticking to my list. He asked me what a mini iron was, so I explained it to him. He brought home a Dritz Petite Press mini iron. Once I tried it out, my life was changed forever. Not only is it easy to use this tiny iron to press seams open, but it has done wonders for my applique abilities as well. I've been able to put away my iron, which saves space in my small sewing area. And I haven't burnt my fingers once. This has been a great solution. I don't know what I ever did without it. I feel as though I've been gone a long time from this blog. It occurs to me that it is very difficult to write about quilting when you are so busy quilting. I just completed another project though, which leaves me a little free time. I made a wall hanging for my daughter, Jenny, who will turn 35 this week. She and her husband have recently relocated to the Boston area, so I made her a quilt I thought might be appropriate. I had a great time working on this, although I didn't give myself much time. I started it on the 13th of August and just finished it yesterday, the 24th. Her birthday is in a couple days. I am grateful to Debbie Mumm for the design and pattern, as it is just what I was looking for. I searched the Internet, knowing I wanted something with a lighthouse. This was perfect. Completing this quilt gives me the courage and inspiration to do more like it. I have always been a little shy about applique. The sea shells, ship's wheel and anchor are all appliqued, while the ship and lighthouse are paper pieced. The rest is just pieced. I've never really been good at needle-turn applique, so when I saw the curves on those shells, I wondered what I was letting myself in for. But, I took it one step at a time, watched lots of You Tube videos, and finally jumped in with both feet. The shells are now my favorite part of this quilt. The ship's wheel really gave me pause too, until I figured out I could do it in two phases, the pegs first, then the wheel appliqued on top of it. I'm really pleased at how all the pieces turned out. Then I thought I would quilt it sparingly, until I got started. I was like a drunk who just took his first swig of whiskey. Once I started, I couldn't stop. The sashing is really densely quilted. But, that's OK, because it toned down the brown fabric. The white thread on top of the brown was just what it needed to blend the color a bit. The only fabric I didn't have in my stash was the border fabric. I actually went to the quilt store to pic out something. What I wanted was a nautical-themed neutral color. No such thing existed, however, so I settled on this mottled gold color. I think it further helped the dark brown blend as well as tying in the color of that one golden sail and the anchor. One more thing, cats just love quilting, as shown. Thanks JR for helping hold this quilt for the picture! No room makeover is complete without something quilted. Over the last couple weeks my husband and I put down second-hand (aren't we lucky) laminate flooring, and painted the walls and doors in our sun porch. For the past ten years, this room has been pink--based on a pink flamingo theme. We both just love the little plastic critters. Besides, I love all things pink. (Note the quilt I made a few years ago on the back of the rocking chair.). Once the walls were painted this color, I remembered that I had made an over-sized square in the same pattern I was planning to use in a quilt in progress. (Stars on Point--see previous posts). When I looked at it, I thought it was perfect as a table topper for this room. So, I set out to free-motion quilt it. Because it was the same pieced pattern as the blocks I'm using in the quilt, I already had a diagram for the free-motion quilting. Because it was so much larger than the initial 12.5-inch block in the quilt, I improvised a little by using a filler inside two of the triple heart shapes and stippling throughout the background. I'm pleased with how it turned out, except that the non-quilted hearts look a little puffy. I may add more quilting in those areas if it doesn't begin to lie flat. I really love these totally non-pressure projects. This was pure fun. It has been awhile since I posted anything about my ongoing project, Stars on Point a.k.a. 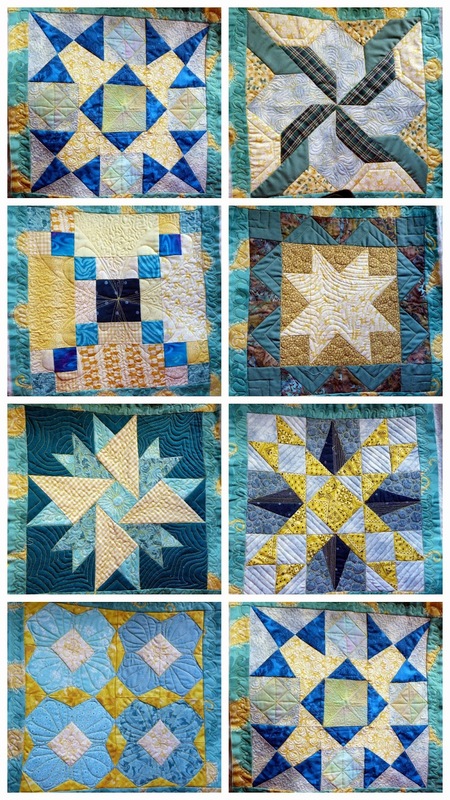 yellow and aqua quilt. The thing is, this has been my go to project of late. I am finally getting comfortable with free-motion quilting, an endeavor I first began so long ago. The nearest I can figure, it was 2011 when I first got the bug to try my hand at machine quilting. My first blog post about it, here, was in December, just days before my 60th birthday. I can't believe it has been so long that I've been trying to master this skill. While I am far from mastering free-motion quilting, it is becoming more comfortable, thus more enjoyable. I've been sitting down to the machine more often now. It has become my happy place. I'm still working on Stars on Point, the quilt I began as a block of the month project on January 2013. In this blog post, from Sept. 2003, I wrote about this quilt and some of my early perceptions about it. Back then, I was just putting these blocks together. Today, I'm writing about they're completion. I admit, I'm starting to get a little antsy now, wondering just what this quilt will look like when it is finally completed. I love starting the quilting on a new block. In fact, I can't wait to start the next one. I still have a couple more to design, but that is part of the fun as well. Letting the blocks talk to me, to indicate just the right design in my limited repertoire, is working. I've long said that I love every aspect of quilting. From picking a design, to choosing fabric, cutting the pieces, sewing them together, to the actual quilting, this is the greatest pastime. I am so hooked on these block of the month projects too, because each block is different and presents a new challenge. This quilt has presented numerous challenges for me, as I've previously mentioned. Those challenges may be the best part though, because each time I overcome one of them, it leaves me with a new understanding along with just a little more confidence to continue on. I admit, and there is much to do before it happens, but I am looking forward to that moment when all the blocks come together to create an entire quilt. It won't really be complete until I can throw this puppy into the washing machine, then the dryer, all the while holding my breath. The real moment of truth, when it really becomes a finished quilt, will not be until it is finished spinning. At that point I will take it out, all fluffy and puffy in just the right places. That day seems like a long way off, still, but I'm already beginning to anticipate it. 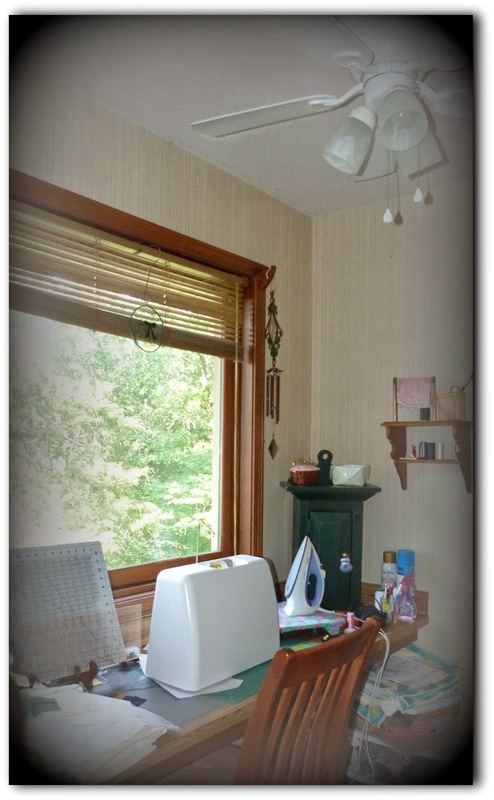 It took just one simple improvement to greatly enhance my sewing space. A new ceiling fan was such a simple fix for what was becoming an annoying situation. While sewing doesn't actually work up a sweat, it does get uncomfortably warm when the pieces in a quilt need pressing and the sewing machine starts humming. And this is a tiny space. While there is an air conditioning vent beneath the table/counter, it sufficiently keeps my feet comfy, but it doesn't really circulate. I believe that in order to maintain good stitch control when free-motion quilting, there has to be comfort. I've changed chairs and now added temperature control. I'm really starting to enjoy my little sewing space. It is such a small thing, but I'd say this is the best home improvement project ever.